Rioja is a region in North-West Spain which is famous for producing high quality red wines, predominately from the Tempranillo grape variety. In 2014 the UK alone imported 33% of all Rioja exports, over 48 million bottles of Rioja, the equivalent of 36 million litres, twice as much as the second ranked country, Germany, so it shows us Brit love a bit of Spanish Red! The region is split into 3 sections, Rioja Alta to the west, Rioja Alavesa to the North West and Rioja Baja to the east, the Ebro River passes through or beside all 3 territories. Rioja Alta and Rioja Alavesa both have a cooler climate than Rioja Baja because of an elevation difference of 300m, Rioja Baja is known for producing fruitier wines than the other two. A first or second year wine that keeps its primary freshness and fruitiness. One year minimum is required in casks and a few months (2/3) in the bottle. It’s slightly different for White Rioja, it’s a minimum of 6 months in the cask. These must be aged for 3 years minimum with at least one year in casks. These wines have excellent potential and are selected for the best vintages. Again it’s different for white wines, the minimum aging period is 2 years and at least 6 months in casks. These are selected wines from exceptional vintages that have spent at least 2 years in oak casks and bottled for 3 years. The minimum aging period for white wines is 4 years with at least one year in casks. Each of the different types of Rioja have coloured labels on the bottles to easily distinguish the difference, Green = Rioja, Red = Crianza, Burgundy = Reserva and Blue = Gran Reserva. 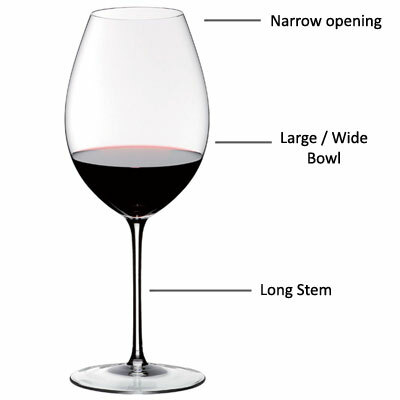 A traditional glass specifically for wines from Rioja feature a medium sized stem and a large bowl that narrows at the opening, it has a tulip feel about it. The wide bowl allows the wine to breath and the narrow opening traps the aromas, keeping the nose of the wine alive when you come to taste and sip the wine. Rioja wine specific glassware isn’t as common as you might think, the popularity of the wine seems to suggest it should be but for some reason manufacturers are generally covering Bordeaux and Burgundy. If you love the wine from region of Rioja, check out our selection glassware for Rioja wines and see how a specific glass behaves compared with a general all round red wine glass. For more information check out the official Rioja UK website.